Standing in the examination room at the Cure Hospital in Addis Ababa, Ethiopia, I was struck with awe while watching Dr. Rick Hodes examine patient after patient with severe spine and heart disease. The line was endless and in only one day we examined over 70 patients — twice the number of patients a doctor in the U.S. would see, all presenting some of the worst spinal cases an American doctor would see in his lifetime. My journey to Rick’s clinic was not short — in fact, it dates back 12 years. It all started when Dr. Hodes came across two abandoned orphans at Mother Teresa’s Mission in the room for sick, unadoptable kids: Dejene and Semegnew. They had ‘V’-shaped spinal columns, severe deformities caused by tuberculosis of the spine. In fact, Semegnew had a 120-degree angle in his back. After careful deliberation, Rick decided to adopt the boys, understanding that in doing so, their surgeries could be covered under his health care plan. Not only was he getting them surgery, but he was also becoming their dad for the duration of their lives, no matter what happened. He phoned a stranger, Jaynie Schultz, to ask if there were any resources in the Dallas Jewish community to help the kids. Jaynie immediately volunteered, “What a great story — we’ll take the kids.” Being close family friends with the Romaners, I found myself at their house every Shabbat and many weekdays. Twelve years later, Dejene, now a handsome and very intelligent young man with no sign of any physical deformity, and I are still very good friends. I finally got the chance to go to Ethiopia to see Dejene’s birthplace and Dr. Rick’s amazing work when Liberal Arts Honors, my program at UT, selected me to receive a “Wise Wanderer Scholarship.” This scholarship afforded me the opportunity to travel to Ethiopia and teach English to children at a youth center serving an impoverished community. Elan Kogutt, wrapped in Tefillin, in the front yard of Rick Hodes’ house with Tuberculosis of the spine patients Mengistu, Behailu and Mikias. I enjoyed the time I spent teaching, traveling and experiencing Ethiopian culture, and I learned more in four weeks than I thought possible. However, the most special moments were those I was able to spend with Dr. Hodes. 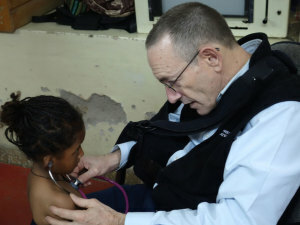 An American doctor who has lived and worked in Ethiopia for over 25 years, Hodes is the medical director of Ethiopia for the American Jewish Joint Distribution Committee (JDC). While training in internal medicine at Johns Hopkins, “Dr. 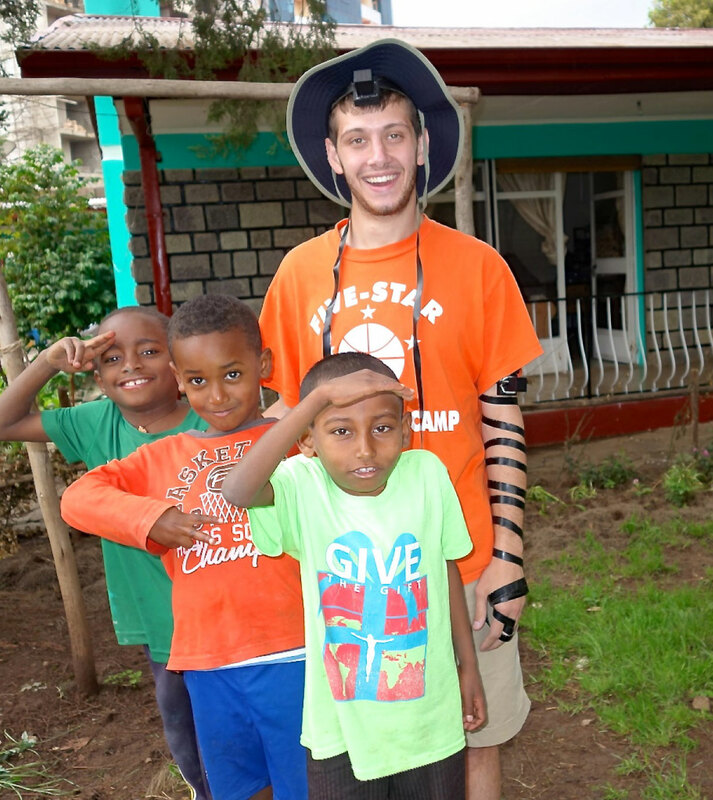 Rick,” as Ethiopians call him, went to Ethiopia as a relief worker during the 1984 famine. He returned to teach at the medical school in Addis Ababa, and then to work for JDC, caring for over 60,000 Ethiopian immigrants to Israel. In 1991, he was a physician in “Operation Solomon,” overseeing all of the medical care to the Ethiopian Jews airlifted to Israel. He has also worked with refugees in Rwanda, Zaire, Tanzania, Somalia and Albania. Currently, he is the senior consultant at a Mother Teresa’s Catholic mission helping the impoverished and runs a major program to help patients with heart disease, spine deformities and cancer. Dr. Rick works at every waking moment, and some speculate as to whether he even sleeps. With such limited access to health care in Ethiopia — one doctor for every 40,000 Ethiopians — and with him personally running the only spine clinic in the country, he believes it is his duty to help as many patients as possible. Without any arrogance he said to me, “If I didn’t help them all these people (his constant influx of patients) would die.” He works at three different clinics seeing patients for free, often giving money from his own pocket to pay for expenses such as the patients’ bus fare so they can continue to visit. From 9 a.m. to 6 p.m. he will see anywhere between 50 and 90 patients, diagnosing a vast variety of illnesses, simple and complex. When I was there I was fortunate enough to witness the process from start to finish: patients timidly coming in to meet Dr. Rick, going through intensive medical tests to prepare their medical file and ensure surgical candidacy and flying from Addis Ababa, Ethiopia to Accra, Ghana where they would get life-saving surgeries at FOCOS Hospital. As they lined up for Rick to take their picture, I felt as though I could make out a word from the misshapen spines. I was incredibly inspired by Dr. Rick. He combines a love for others with practical application. I will always cherish the memory of putting on Tefillin with Rick in his front yard while two adorable young boys with severe TB of the spine in the first stages of the extensive surgery process, reminiscent of the position my friends were once in, played soccer around us. I prayed the portion of the daily prayers about healing the sick with extra kavannah (strength) that day. To learn more about Dr. Rick Hodes or make a charitable donation to his projects, visit his website www.rickhodes.org. He is the subject of a book titled, “This Is A Soul: The Mission of Rick Hodes” by Marilyn Berger. A new film about him, “Zemene,” will premier in Boston September 28. Elan Kogutt is a graduate of Yavneh Academy of Dallas and is now studying psychology and business at The University of Texas at Austin.